Ever since we started publishing pictures of our crew holding artifacts without using gloves, we have taken some heat in the Facebook comment sections. People have been worrying (or even cringing) about bad effects of touching the artifacts with bare hands. Their worry is that this could contaminate the artifacts with body oils or DNA. This blogpost explains why using gloves in the field is not necessary. When artefacts are handled in museums, you will see the museum staff wearing gloves while holding the objects. This is done to protect the artifacts from getting into contact with body oils and other residues on the person’s hand. It may seem like an obvious conclusion that the artifacts should also be handled wearing gloves in the field. However, this is rarely seen in practice. Why is there a difference in procedures? The difference is simply that the objects in the museum collections have been cleaned and conserved. The objects in the field have not. The need to protect for instance metals from body oils and other residue is really just a concern, when you touch the actual cleaned metal. Any small remains of body oils or other residues left by us is removed during the conservation process. Are there instances, when artifacts should be handled with gloves in the field to avoid contamination by body oils? Yes there are, but these are not relevant to glacial archaeology. One such case is if you want to apply biomolecular analysis to pottery sherds, such as lipid analysis. In that case, even trace amounts of modern body oils could mess up the analysis. What about DNA? We have gotten a number of comments from people, who are concerned about DNA-contamination. Are we contaminating preserved ancient DNA material on the surface of the artefacts by touching the objects with our bare hands? It is important to have a realistic picture of the preservation conditions at the ice. The vast majority of the objects have been repeatedly exposed to the elements, even though they still look incredibly well preserved, compared to “normal” artifacts. The inside structure of the artifacts is in fact remarkably intact, but the surfaces are weathered to a varying degree. This would have removed the DNA from the people who originally handled them thousands of years ago. Even if the ancient DNA should still be preserved in rare cases, the problem of contaminating samples with modern DNA is not really a problem anymore. In the early days of DNA research, there were reports of finding preserved DNA on ancient human bone. These later turned out to be modern contamination. Modern DNA techniques, however, have no problems separating original ancient DNA from modern contamination (read the seminal paper on this issue here). Ancient DNA has now been extracted from human bones which have been stored for in the museum vaults for decades and handled by a number of museum staff. Today, modern contamination is really just an issue, if the amount of contamination is very high compared to the sample size. This is why researchers are very careful when handling tiny DNA samples in the laboratory. 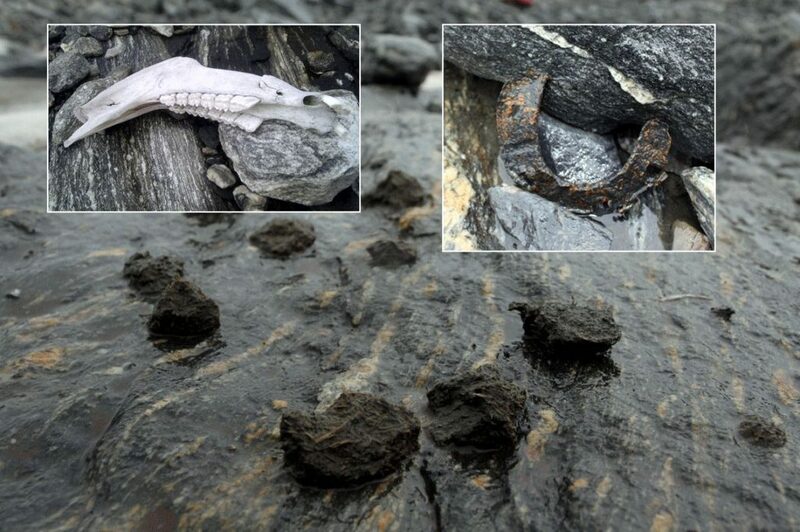 Viking Age and Medieval horse dung found in the glaciated mountain pass at Lendbreen, together with horse bones and horseshoes. Photo: Secrets of the Ice. DNA analysis has been undertaken on some of our reindeer bones and antlers, and ancient reindeer DNA was found. These samples, however, derive from the insides of the objects, not the outsides. In addition, a test was conducted to look for ancient horse DNA in the horse dung from the Lendbreen mountain pass. The dung had been radiocarbon-dated to the Viking Age and Medieval Period. It looked well preserved with straws visible. However, the actual horse DNA was very degraded due to bacterial activity. It was not really suited for detailed analysis. Is it necessary to use gloves to handle artefacts during our glacial archaeological fieldwork? The answer to that is no, unless it is freezing, and we keep our gloves on for protection against the cold. We like to keep it simple in the field, as conditions can be rough. If procedures are not strictly necessary, we skip them. So, no gloves and no white lab coats. That said we do have a CSI kit ready at the local Mountain Center, in case we find an ice mummy. However, this is not only to protect the mummy – the protection works both ways (read about ancient bacteria and virus in the ice here). The finder holding the Viking sword without gloves, just moments after he discovered it in the scree. Photo: Einar Åmbakk. 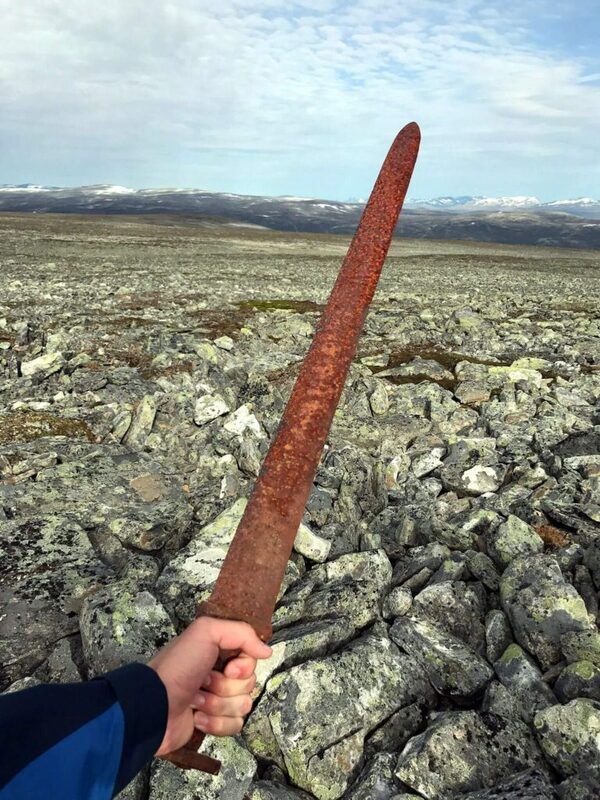 As an aside: do you remember the Viking sword that was found at high altitude here in Oppland this fall? If not, read here. The lucky finder had no idea how old it was, and never even thought about using gloves to hold it. When we published the picture, he got some flak in the comment section for not using gloves. We had to explain that he was not an archaeologist. Handling the Viking sword with gloves prior to conservation, due to the presence of bare metal without corrosion. We did wear gloves, when we handled the sword in our office and shot the video that went viral. Isn’t this a contradiction of what I just wrote? No, the reason was that the bare metal on the blade was visible. We suspected that it would need little actual cleaning and conservation. This was later confirmed by the archaeological conservator at the Museum of Cultural History (read his very interesting post on the sword here). The result: We got comments from people, ridiculing us for using gloves to handle a sword that had been lying out in the open for 1100 years. D’oh!